Hello my lovelies, today I want to talk to you about one of my latest discoveries Sabrah Oil a Powerful, Precious & Pure Prickly pear seed oil, 100% organic, fair traded and absolutely luxurious like you deserve. When I started my Instagram page I did not think this will happen; I only knew that I'm obsessed with skincare, I always was, and I like Instagramming. Is a hobby for me, a way to share my findings, talk about my experiences with products, because I believe there are more women like me out there! Women's with problematic chronically dry skin and a pretty tight budget. Instagram was how I met and started to talk with the amazing Sonia K.
Sunia is a busy working woman trying to prevent her flare-ups of psoriasis, the owner of Sunia K. Cosmetiques a high-end line of natural and pure beauty products designed to work in harmony with body and mind to help women feel at ease with themselves, beginning with carefully sourced raw oils that deliver high-performance results. Sunia K. Cosmetiques is also sustainably sourced and packaged, and fairly-produced business and as if that wasn't enough she is also helping by creating jobs in areas of Tunisia with over 40% unemployment, reducing poverty, empowering women, and strengthening community! She really does sound like a gorgeous soul and wonder-woman to me! 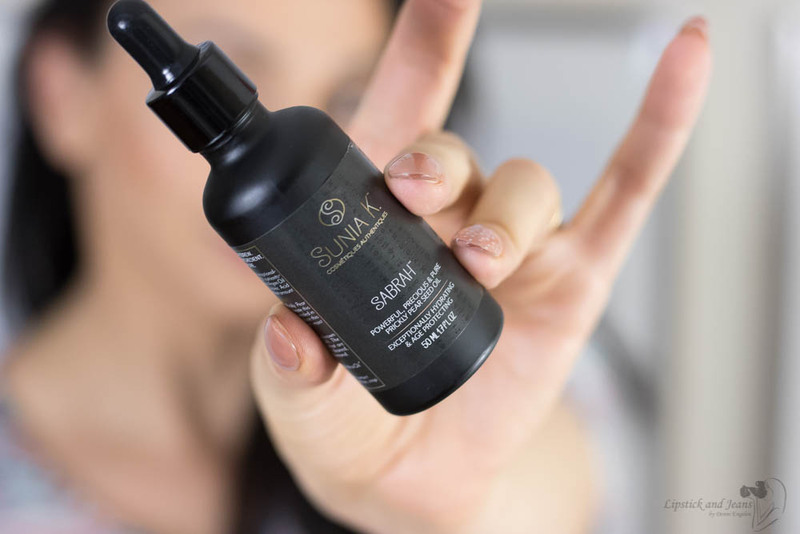 Back to the story , Sunia contacted me somewhere mid-November asking me if I would like to test her Sabrah Oil, and that was in a period that I was continually complaining about how bad my skin hates me, and how was I changing routines in hope to make things work again. Obviously I said YES! not only because I love discovering new products brands that are just beginning their journey but also because I already liked her and her company mission and I was really really intrigued about the product. 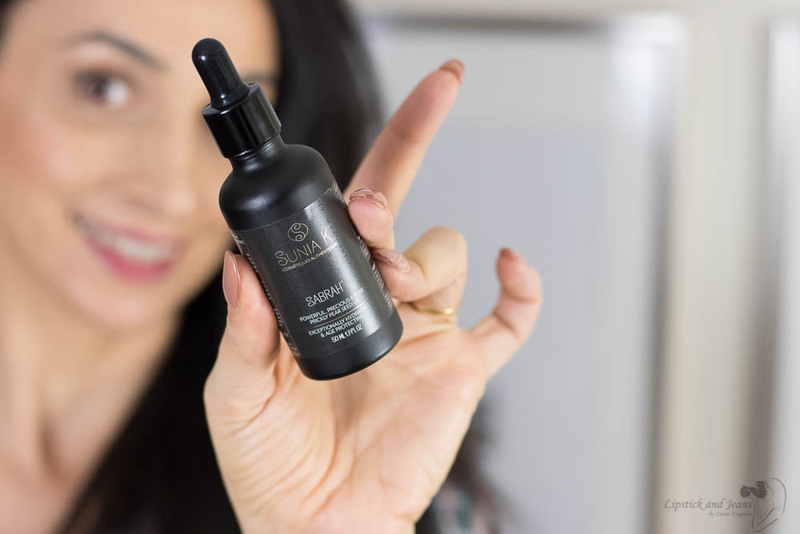 For starters I never heard about Prickly Pear Seed Oil, although I was familiar with the fruit and because Sabrah Oil is a straightforward 100% natural product but still having that luxurious pampering feeling you only get in high-end products. I don’t mean to be superficial talking about packaging, but for me packaging is essential; I love great packaging that makes me feel like a queen when I use it! And that doesn’t cost the earth, also very important. Yes, is correct at the end of the day is only the product that matter, if delivers or no. I agree! But I also know that for most of us hard working crazy busy bees skincare lovers, routines is maybe the only time in a day when we get a little bit of me time, the only time in a day when we do something exclusively for us. And I believe in the healing power of self-pampering. 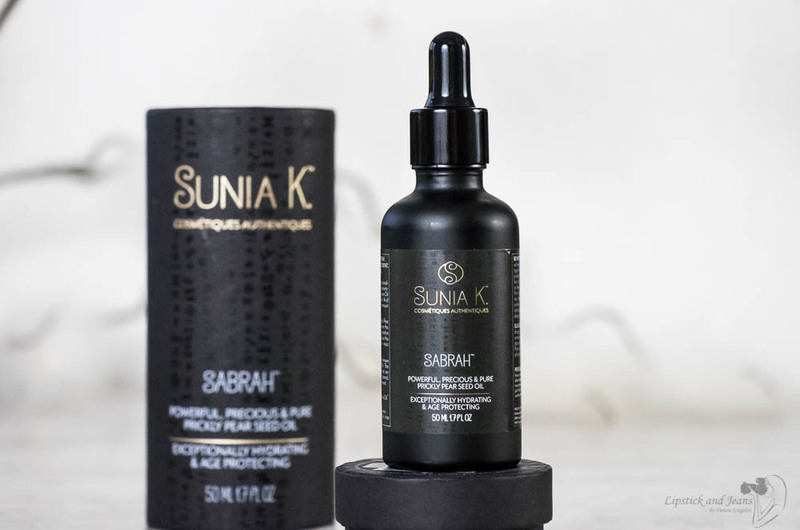 Sunia K Sabrah Oil comes in this beautiful matte black carton cylinder box packaging that is eco-friendly and is made with 50% or recycled paper, golden logo and details and white text containing the oil proprieties, benefits and suggested use along with a personal message from her. On the matte black background, there are some glossy hieroglyphs’, that alone will make you feel like a queen. The oil itself comes in an all black glass bottle with a dropper having the same design elements and details like the box. Wish it came with a pump, yes, but dropper bottles are the norm these days! Smooth the tiniest amount into nails to boost their strength and shine. Add a few drops of Sabrah Oil to your preferred moisturizer or a carrier oil like sweet almond or coconut. Massage into skin to enjoy an excellent whole body treatment. 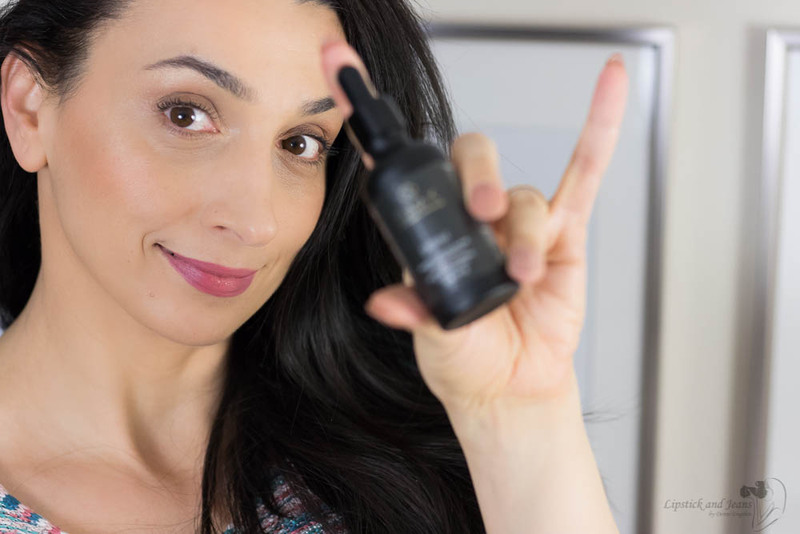 First I was pleasantly surprised by the lightness of the Sabrah Oil; my skin drank it almost immediately leaving my skin soft like a baby bum and beautifully dewy, not greasy at all. Also, I found the smell of it very soothing! That may be because I grew up on a farm and I love the dried hey smell, but if you are not a fan of scented stuff don’t worry is not strong smell also, is the natural smell of the oil, no fragrance has been added to it. I used Sabrah Oil both alone and mixed in my moisturizer, and I can say mixed in the moisturizer it does behave well under the makeup but the most of it I got when I use it alone. Overall it helped me a lot with the dryness and sensitivity created by retinol ( I started using retinol two weeks ago, and m skin reacts a bit ) use in the PM. After a few weeks of use, I noticed improved elasticity in my skin, the lines around my eyes where visibly softened and my face seems to glow, I did receive quite some compliments about it. And I said before I love the fact that is 100% natural, and that is easy to use and luxurious. We all need a little bit of self-pampering. Note. I received this product complimentary from sunia-k.ca. I'm not paid to write this, and this post is not sponsored. All opinions are 100% my own, and I take my reviews seriously. This is my first time hearing this brand and I have to say, it sounds amazing. There's so much to love about it aside from the product itself. I like that it's vegan and cruelty free! I love products that have a pretty packaging as well, and I love them even more when they're really reliable. I've never heard of this brand but it does sound like it's worth it. It's perfect for my dry and sensitive skin! I am an oil fanatic so this is pretty cool to see. I love Anything that is natural, vegan and animal friendly. Thanks for introducing me to this oil! This sounds like an awesome product. I especially like that it is vegan friendly and has not been tested on animals. It looks like I'll have to give it a shot. Wow, thanks for you review. At least we have an idea that this really works. My friend has psoriasis, and I think she tried some products that didn't really work. I hope this one will be ok to her. It will really help her a lot. Thanks a lot for the review of Sabrah Oil, the best part is that it is natural, vegan and animal friendly! 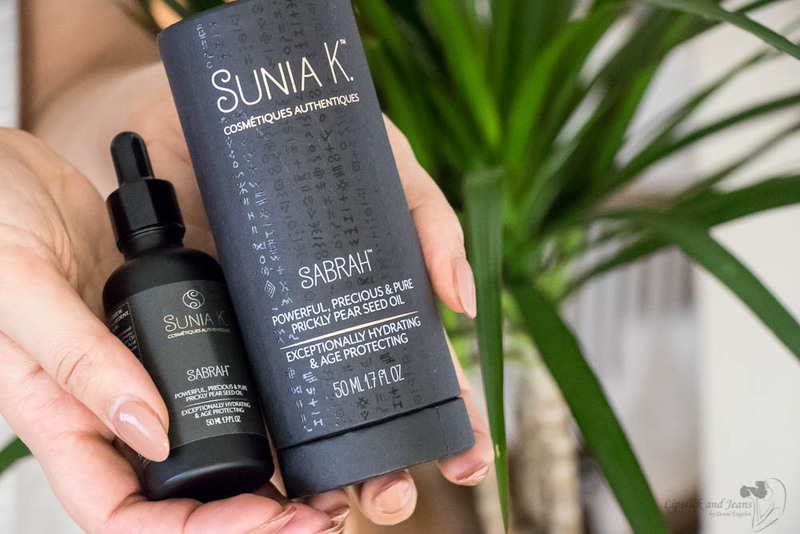 "Sunia K. Cosmetiques is also sustainably sourced and packaged, and fairly-produced business and as if that wasn't enough she is also helping by creating jobs in areas of Tunisia with over 40% unemployment, reducing poverty, empowering women, and strengthening community! She really does sound like a gorgeous soul and wonder-woman to me!" Wow Demi ! I love how detailed your review is. This is the kind of article I really enjoy reading because for a beauty novice like me it`s important to get quality information. Also, your pictures are stunning. Great review! I love all of your points here and it's really made me think about giving this a go! I love using oils! Sounds like an awesome product. I love to use oil as well as part of my skin, day to night. Great review as well.